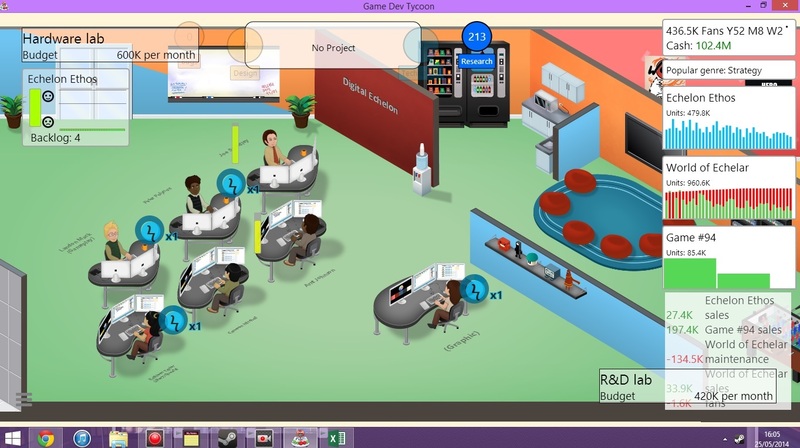 This week I’ve been celebrating finishing university by playing Game Dev Tycoon. This is a Steam game, developed by Greenheart Games and available for £6.99. When I Initially loaded the game, it seemed quite linear and simple. The first stage of levelling- going from a one-man-band in your own garage, to moving into your own office, went well, and made it seem like the game would be quite easy to complete. Once I got to the middle stage of the office, and starting employing people and making larger games, the game opened up a lot more. So much more, in fact, that I then realised I was only looking at a narrow area of the game. Levelling up staff and unlocking extra elements to include in created games are both set up by the same thing, Research Points: as it isn’t always clear how to get more research points, I didn’t have enough to unlock many things that in a real-life scenario would be company-destroying. I would have preferred RP for games and staff to be slightly more separate, as it could have opened up more defined routes for the game, such as focusing on creating superstar staff who developed contracted games, or average staff putting all their focus into being at the cutting-edge of technology. While these options can obviously still be done in the game, it would have been nice if you could grow into a certain type of studio. Furthermore, the research system seems imbalanced compared to real life. Without deliberately playing badly, I was developing for the in-game equivalent of the PS4 and Xbox One, without having unlocked online play or even 3D graphics. Realism fail. Probably linked to this is the sense that the endgame seems to happen too early. I had finished the 35-year development campaign before I got to access major parts of the later game such as making my own console and investing in R&D. Although it’s important to note that the game continues for as long as you want after the 35 years, it just means no new consoles or technologies are introduced to the industry. For example, my save file is currently on Year 53, and now I’ve got to the point of creating own console and my own Steam-esque distribution platform, that’s opened up even more areas to progress in. It would perhaps make sense if technological improvements were made easier to unlock but were required more often, maybe making progression more forced- as it is easy for a player to develop one engine then stagnate for years, in a way that could not be done in real life. Lategame developments and the different areas that can be managed. An average (in both senses) game review. 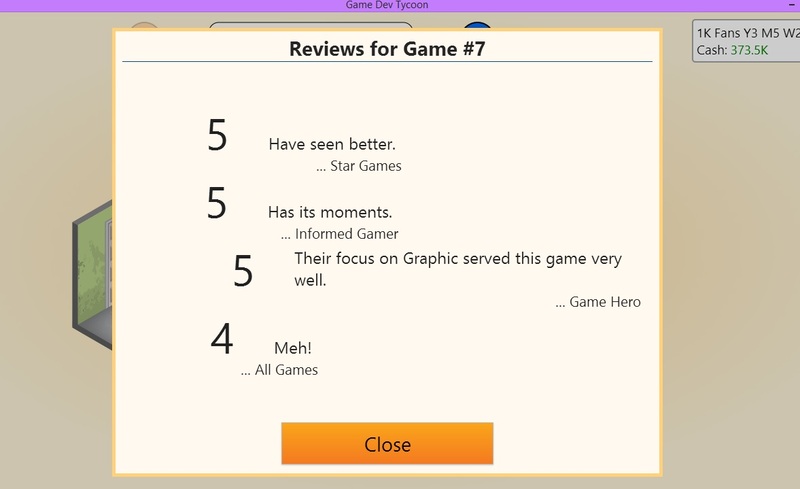 After games are released, they are given an aggregate review score. You can also analyse games after they are released, which provides hints about whether the genre, topic, and audience matched up, and whether your team had even workloads. This doesn’t go into much depth, meaning it can be very difficult to work out exactly why your game was a 8 instead of 10, or a 3 instead of a 5, using the information provided in-game. However, the scores are awarded according to an algorithm, which the wiki and online community have extracted and created spreadsheets from. The spreadsheets specify the correct level for each variable in each development stage, meaning a sufficiently-thorough player can score perfect 10’s every time. The only major criticism of the game I have is this setup, which means a player has the dichotomy between having nowhere near enough information, or too much. In attempting to make a simulation of something as complex as game development, it either needs to be incredibly realistic and detailed, or obviously simplified and arcade-like; GDT, while a fun game, is neither of those two things, and suffers slightly for it. Most achievements in the game seem fair without being too easy or difficult- most are for tasks like hiring members of staff, or selling large amounts of games..
Two seem very difficult at the moment, namely, selling 100 million games without a publisher, and making a perfect 10/10 game. As the 100 million achievement precludes MMO’s, the only type of game that can be sold indefinitely, it is hard to see how this could be done. There are also some Easter Egg achievements, such as naming your developed games after famous games, or naming your studio after a famous studio (including, as a nod to the developers, the developers studio). This creates a sort of alternate history idea for the game which is both good in terms of continuity nods, but bad in terms of dissonance as it makes the unrealistic aspects I mentioned about research earlier stronger. Overall, I would still recommend playing this game- it’s fun, accessible, and has the slight-obsession-causing nature of a good sim game. However, GDT probably wouldn’t be the best option for people wanting a serious game-dev game, as the lack of in-depth information may get frustrating.